This E-Book has all you need to know to get the best out of your new Nikon D5200. It will be updated regularly and you will get everything for a single payment! Check out this excellent E-Book for the new Nikon D5200. 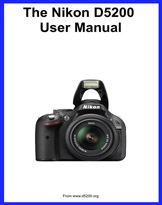 This manual has been written especially for the new Nikon D5200. It begins by showing you how to start using the camera and how to get the best from it. Later editions will give detailed information about various aspects of the camera. This edition is $10 and every further instalment is FREE.